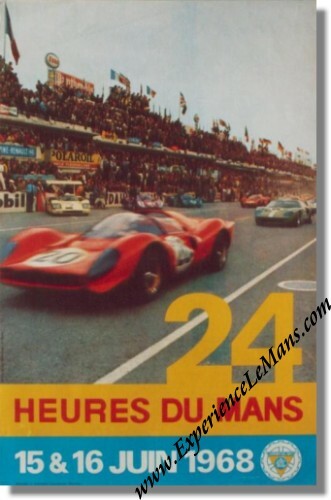 Vintage June 1968 24 Heures du Mans Poster. The race was postponed to September due to the infamous students riots. June 15 & 16, 1968. The layout and production of this poster were in the hands of Imprimerie Oberthur who realized this poster based on a color photograph, by Andre Delourmel, of the start of the 1967 edition. It is in near mint condition for its age with some very minor wrinkling over a length of about 2 inches on the right hand border which doesn't distract from the overall appearance. The race was won by Pedro Rodriguez & Lucien Bianchi in their # 9 John Wyer Ford GT40 with a total of 331 laps to their name. For the full results of this race, please see 24 Heures du Mans results 1968.